In our house, most usually found chucked into a roasting tin with a quick baptism of olive oil, salt and pepper, then unceremoniously slammed into a hot oven for an hour and a half. There’s nothing wrong with that, and as a zero effort default dinner, there’s little to compare to a well-roasted chicken, but – and this is a very big ‘but’ – it feels lazy. It feels adequate, but unadventurous. It feels safe. A chicken is a versatile thing. It leans towards a great many types of cooking, and it’s present in the food of most nations, so there are options out there should you choose to go looking for them. This book, Chicken and Other Birds by Paul Gayler, collects together about a hundred of these options. A very useful collection it is too, focussing largely on chicken, but taking in the bird’s near relations, such as duck, guinea fowl, pigeon, quail, turkey and goose. 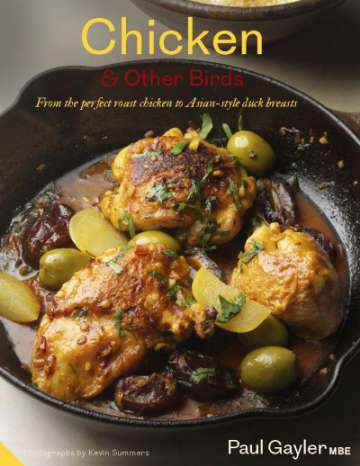 The book is split up into chapters centred around different methods, such as braising and casseroling, poaching, smoking and steaming, or sautéing and deep-frying, kicking off with some detailed guidance on breaking down a chicken into four and eight pieces, trussing a bird for roasting, and how to insert stuffing under the chicken’s skin, which is the single best thing you can possibly do. There’s nothing improves a simple roast bird more than a stuffing of bacon, butter, lemon, and thyme stuffed between the skin and flesh. If you do nothing, do this. There’s a real breadth to Gayler’s book, enough coverage of the sort of recipes you’d expect to see – various casseroles, Southern-fried chicken, a Normandy style chicken braise with cider – and plenty to challenge. Devilled guinea fowl legs .. confit guinea fowl legs, seasoned heavily with mustard and paprika, breadcrumbed and deep-fried, then served with a sharp salsa verde and some creamy lentils looks like it might find its way into my repertoire soon. I sometimes find myself stuck for inspiration, and I like to read cookbooks for ideas, for hints and clues on what flavours go together, what to try out next. Chicken and Other Birds is packed with those little hints and ideas, and it looks set to transform how I look at that most adaptable of ingredients.